Old Bollywood pressbook of the hit Hindi film Guddi (1971) for sale. 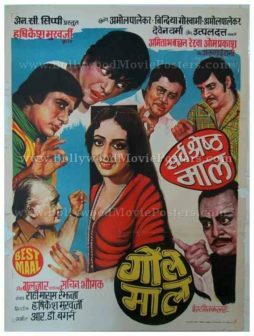 This is an actual surviving rare Bollywood old pressbook of the 1971 comedy directed by Hrishikesh Mukherjee that starred Jaya Bhaduri Bachchan in the lead role. Printed and circulated a few years after the original first release of Guddi in 1971, this rare Bollywood old pressbook was distributed to cinema audiences outside movie halls that actually screened the film. Jaya Bhaduri Bachchan received a Filmfare nomination as Best Actress for Guddi and the film was a milestone in her career, making this rare Bollywood old pressbook highly collectible! 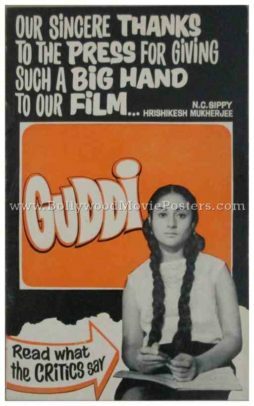 Guddi is a 1971 Bollywood comedy directed by Hrishikesh Mukherjee and written by Gulzar. It starred Dharmendra, Jaya Bhaduri Bachchan and Utpal Dutt in lead roles. The film provided a rare behind-the-scenes look at the Bollywood industry in Bombay during the late 1960s and early 1970s and featured cameos from several superstars of the time including Amitabh Bachchan and Rajesh Khanna. 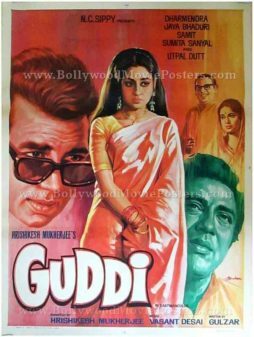 Very rare, original vintage Bollywood movie poster of the hit Hindi film directed by Hrishikesh Mukherjee, Guddi (1971) for sale. This is an original hand painted Bollywood poster of the 1971 comedy that starred Jaya Bhaduri Bachchan in the lead role. 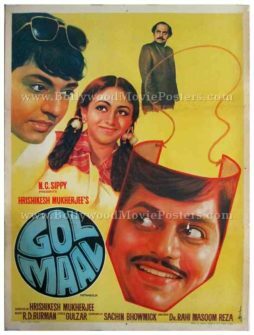 Jaya Bhaduri Bachchan received a Filmfare nomination as Best Actress for Guddi and the film was a milestone in her career, making this poster highly collectible! 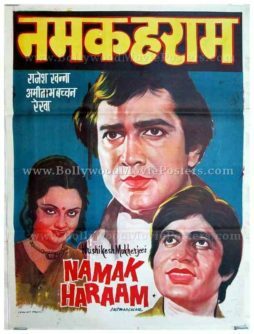 Printed and circulated during the first release of the film (early 1970s), this hand painted Bollywood movie poster was originally designed for publicity of the film but never ended up being used. This Bollywood poster features stunning hand painted artwork created by the finest Bollywood poster artist in the history of Indian cinema, Diwakar Karkare. The poster bears telltale signs of Diwakar’s mastery and flair. Multiple color tones are seen in the background. A stunning portrait of the lead actress Jaya Bhaduri appears at the center. The object of her obsession, Dharmendra is seen on the left. Diwakar’s printed signature is present on the bottom right of this rare masterpiece. Original vintage hand painted Bollywood poster of the Hindi film, Phir Kab Milogi (1974) for sale. This is an actual surviving old publicity poster of the 1974 classic Hindi romance that featured Dilip Kumar, Mala Sinha and Biswajit. Printed and circulated in the 1970s, this rare movie poster was originally designed for publicity of the film but never ended up being used. This beautifully hand painted old Bollywood poster features stunning portraits of Dilip Kumar, Mala Sinha & Biswajit in various poses. 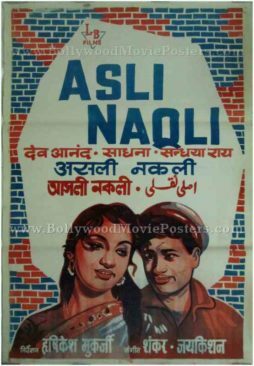 This vintage original Bollywood poster has its title and credits written both in English as well as in Devanagari Hindi. 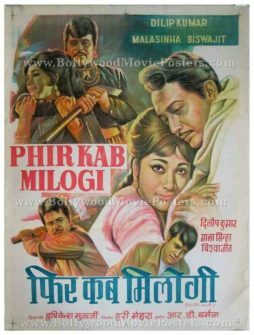 Phir Kab Milogi is a 1974 Bollywood romance directed by Hrishikesh Mukherjee starring Mala Sinha, Dilip Kumar and Biswajit in lead roles. The music for the film was composed by R.D. Burman. 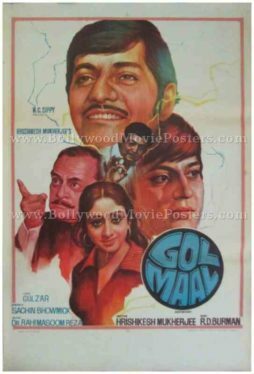 Rare, hand drawn old Bollywood movie poster of the blockbuster Hindi film Gol Maal (1979) for sale. 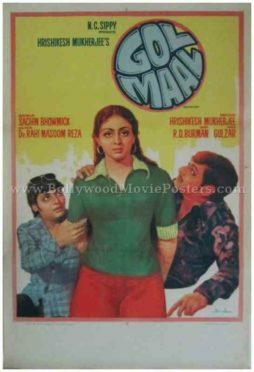 This is an actual surviving poster of the 1979 Bollywood movie that is unanimously considered to be the greatest comedy film ever made in Indian cinema. In the film, actor Amol Palekar appears in a double role. This is highlighted in the poster by crediting his name in the star cast twice. 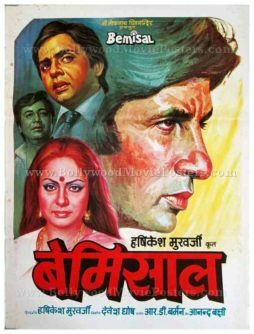 The poster also capitalizes on Amitabh Bachchan’s superstardom by not only crediting his guest appearance on the poster, but adding his hand drawn portrait on the side. A surprisingly accurate portrait of Utpal Dutt is seen painted on the bottom of this quirky movie poster. This poster has been graded as ★ AI (As Is) due to several cracks that have been repaired by applying necessary taping at the back. Further, this poster has a several missing pieces along its borders, which can be seen upon closer inspection of the photograph (both on the left as well as right sides). The reverse of the poster features extensive taping that has been applied to repair multiple tears.